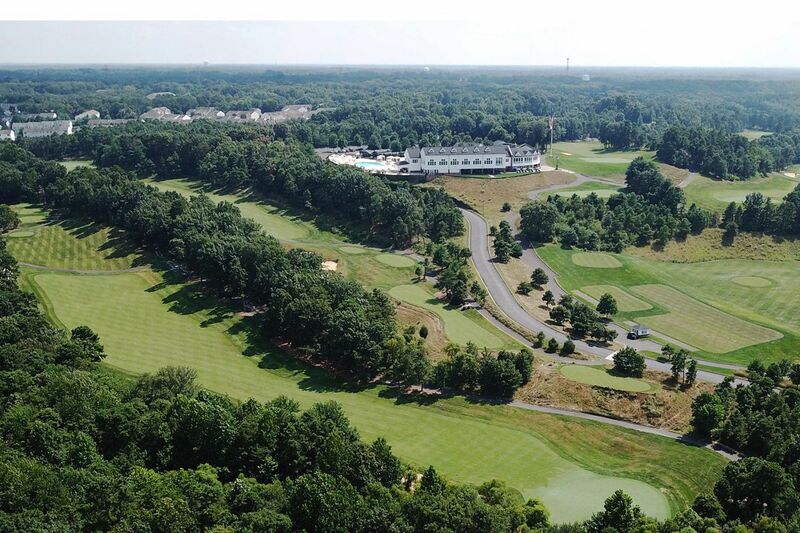 Trump National Golf Club Philadelphia makes up most of the Pine Hill, N.J., Census tract designated as a "Qualified Opportunity Zone" under part of the federal tax-cut signed into law in December. South Jersey properties selected by state officials to benefit from a new federal tax break include construction sites in needy cities, apartment complexes for low-income renters — and a sprawling golf course run by the president of the United States' private enterprise. Trump National Golf Club Philadelphia makes up most of the Pine Hill census tract designated as a "Qualified Opportunity Zone" under a provision of the federal tax-cut bill signed into law in December that aims to promote development in rural and low-income urban communities. Under the new law, people and companies that owe taxes on investment gains can delay payment of those levies — and at least partially whittle them down — by redeploying that cash into real estate ventures or other businesses set up in opportunity zones. Those incentives could attract investment in a new restaurant or hotel at the Pine Hill golf course property, which the Trump Organization runs on land owned by the Camden County borough under a long-term lease, said Glenn A. Graff, a real-estate law specialist at Applegate & Thorne-Thomsen PC in Chicago. While the law bars investment in "sin businesses," which include golf courses, "there could be a way to do these things," said Graff, who has been tracking the program. "It would need to be properly structured and separated out." There has been no suggestion that New Jersey officials were aiming to aid Trump's business interests when they selected the section of Pine Hill that includes the golf course as one of the 169 tracts forwarded to the U.S. Treasury Department for opportunity zone designation earlier this year. Gov. Murphy, both of the state's U.S. senators, and a majority of its U.S. representatives are all Democrats. And almost twice as many Pine Hill Borough voters cast ballots for Hillary Clinton in the 2016 general election as for Trump. Trump's potentially benefiting from a federal program that he signed into law and that is administered by his Treasury Department opens a fresh avenue of possible conflict for a president who has broken with the convention of placing business holdings in a blind trust, as his predecessors have done, said Norman Eisen, who served as a White House ethics official under Barack Obama. The Trump National Golf Club falls within the boundaries of a census tract designated for Opportunity Zone tax-break status. "By breaking that long bipartisan precedent, that now creates situations like this one in which you potentially have a president gaining benefits that are forbidden by the Constitution," said Eisen, currently co-counsel in two court cases that accuse Trump of using his position to illegally benefit his businesses. Under last year's legislation, which is still being translated into guidelines for investors, those with capital-gains income can put off paying taxes on those earnings by investing them into businesses or property in an opportunity zone. If they keep that investment long enough, their tax bill on those original gains is reduced and earnings from the new opportunity zone venture are not taxed. The legislation left it up to states to identify opportunity zones within their borders, instructing them to designate up to a quarter of their census tracts with poverty rates of at least 20 percent or median household incomes up to 80 percent of the state's or surrounding area's. Murphy administration officials worked with the office of Sen. Cory Booker and met with New Jersey's other congressional leaders and with mayors throughout the state "to ensure a fair and transparent selection process aimed at identifying the most distressed communities in need of investment," Department of Community Affairs spokeswoman Lisa Ryan said in an email. Other South Jersey zones include those encompassing Camden's Delaware River waterfront and its neighborhoods flanking Admiral Wilson Boulevard, parts of Woodbury and Glassboro, and much of Atlantic City, according to a map compiled by the state. The tract in Pine Hill — between Little Mill Road and West Branch Avenue, north of Hickstown Road — was selected based on the need for investment in the zone's eastern section, where poverty rates among the tract's 3,300 residents are double the state average, Ryan said. "The presence of a golf course in the western part of the municipality had no bearing on the need for economic opportunities for the residents of Pine Hill, which remains one of the most distressed communities in both Camden County and New Jersey," she said. Trump National Golf Club Philadelphia's grand entry gates empty onto a strip of Branch Avenue lined with modest rental complexes, including the Mansions affordable housing development, owned by a unit of Portland, Maine-based Low Income Housing Corp., where police broke up a crack-manufacturing operation last year. The entrance into the Trump National Golf Course clubhouse in Pine Hill. Trump's 365-acre, 18-hole golf course, by contrast, features manicured greens, an elaborate neoclassical fountain with spitting lions and a view of the Center City skyline from what's said to be the highest point in Camden County. Since buying the club in 2009, the Trump Organization has spent $11 million on improvements to the property, which included the construction of a 22,000-square-foot heated saltwater pool complex and renovations to the course's 43,000-square-foot clubhouse, Eric Quinn, the course's general manager, told the Inquirer two years ago. Quinn suggested at the time that a hotel could also be in the works. The Trump Organization did not respond to an email asking about any development plans at the Pine Hill course that would take advantage of its new opportunity zone status. A White House spokesperson directed questions to Trump attorney Sheri Dillon at Morgan, Lewis & Bockius LLP in Washington, who did not respond to email and phone messages asking about potential conflicts that could arise from the zone designation. Pine Hill Borough business administrator John Greer also did not respond to a phone message. Graff, the attorney, said a new business on the Trump golf course wouldn't necessarily run counter to the objective of the zones, since it could result in new construction or service jobs for the surrounding community. "If it's creating more jobs and more business there, maybe that's a good thing," he said. But Eisen, the former ethics official, faulted Trump for putting New Jersey in a situation where it's forced to balance a potential conflict within its borders against the investment needs of its poor communities. "He's thrusting an additional problem on them," he said. "As it's attempting to address its high poverty and other legitimate concerns, the state should not have to deal with President Trump's unconstitutional insistence on hanging onto his businesses." The tract in Pine Hill was selected based on the need for investment in the zone’s eastern section, where poverty rates among the tract’s 3,300 residents are double the state average, a state spokesperson said.